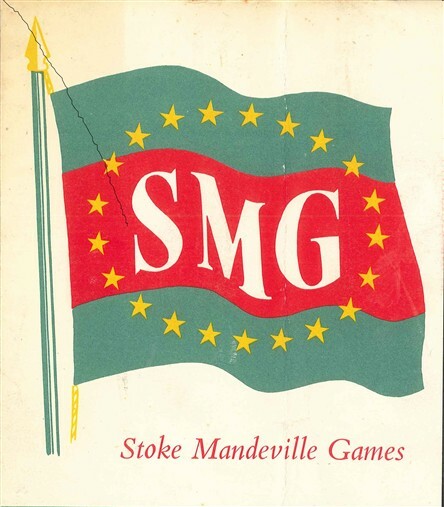 The pattern of games at Stoke Mandeville in the 1950s was for the National games, attended by teams from various spinal units and disabled sports clubs around the country, to take place in June. Then later in the summer this would be followed by the International Games, attended by a growing number of national teams from other countries. Despite their international staure, the games retained a small-scale and almost home-spun quality in the 1950s: the sports events were run by nurse and physios who Guttmann 'expected' to help out. The participating teams were put up in empty hospital wards and fed and attended to by volunteers from Aylesbury and the surrounding villages. But there was little sense yet of the games being an event that local people would want to come to watch; the audience was still mostly the friends and relatives of participants and of the hospital staff. 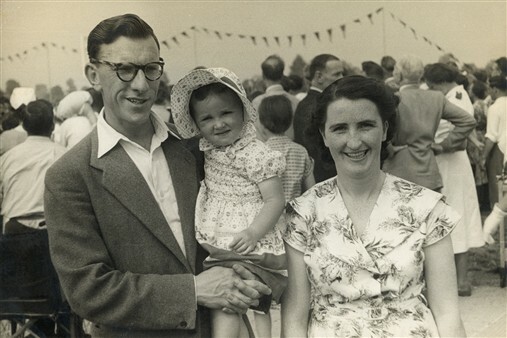 Mary and Jimmy Brennan with their daughter watching the 1955 Games at Stoke Mandeville. Mary and Jimmy were both nurses at the hospital. The logo for the 1956 international games. 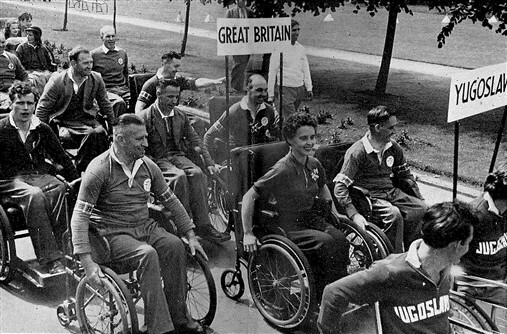 Various nationalities were represented by 1951, but the first ‘international’ competition at Stoke Mandeville occurred in 1952, when a small team from the Military Rehabilitation Centre at Aardenburg near Doorn in the Netherlands competed against a number of British teams. By 1956, there were 18 different nations participating in what was arguably the first truly international games: USA, Australia, Israel, South Africa, Malaya and Pakistan were among the competitors. 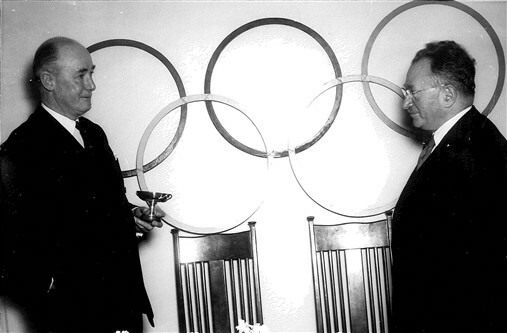 The Stoke Mandeville Games were presented with the Fearnley Cup by the International Olympic Committee in 1956, an award for outstanding contribution to the Olympic ideal. 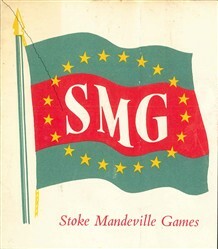 Guttmann saw this as acceptance of the Stoke Mandeville Games into the Olympic family. However, it was to take over thirty years for the Games to truly be on a par with the Olympics. The 1957 Games was the first time that all five continents had been represented, and in 1958 the competition to take part was such that the British team had to hold a national Games prior to the main Stoke Mandeville Games in order to select the team. "One of the great things about Stoke Mandeville was the way it affected the international treatment of paraplegia. By the 1950s physios were coming from around the world to train here and Guttmann had introduced an educational programme for the doctors accompanying the teams running parallel to the games. In 1950 several members of the French team that came to the games at Stoke all had pressure sores; they hadn’t yet learnt the importance of treating these; but after the French doctors saw the British team then they were able to learn from that and treat accordingly." Brom, physio. My fathers name was on lots of the boards in the archery hall at Stoke Manderville and he won lots but I cant find anything about him online anywhere. He also went to the paralympics, my mother hasnt got a good memory but she thinks it was the late 50's ish.. I think it was the Netherlands and he won medals there too but again I cant find him mentioned anywhere.. Can anyone help please. His name was Albert Ronald Aldwinckle. Not this page in particular, but BBC London News item 20 Aug.2012. on Stoke Mandeville/Paralympics. The black & white still of four gentlemen in wheelchairs, the first gentleman in the line-up looks remarkably similar to my great-uncle Charles Harvey, who was a patient for many years of the great Dr Gutteman. Uncle Charles sister (my grandma) would visit her brother in S.M.H. (travelling on the old Green Line coach all the way from Morden) in the 1950's / early 60's, and return full of praise for hospital & staff! Now, around 50 years down the line, what was a town and hospital on a map to me as a youngster raised in Surrey, has since become our district A&E department! What memories that photograph evoked, even if it isn't Great Uncle Charles! Kind regards, Sharyn O'Brien. Kind Regards, Sharyn O'Brien. Robin Paisley, my late husband, was captain of the hospital's archery team in 1955. He came to Stoke Mandeville from Melbourne, after his flying accident in 1953 left him an incomplete paraplegic. There was no spinal unit in Australia and he was determined to learn to walk. Undeterred by being told of a 2 year waiting list he became an out-patient, living in Aylesbury. He achieved his goal, throwing away his crutches in exchange for a shooting stick, and only used a wheelchair for the last decade of his life. In 1960, Robin was instrumental in bringing Dr David Cheshire from the UK to found the spinal unit at Melbourne's Austin Hospital and, with physio friends, also formed what became the Paraplegics' Association in the same year. Thanks to "Papa Guttmann" Robin led a full and independent life, an inspiration to all he met. Congratulations to the UK for telling the world how and where the Paralympics began. My grandad, Arthur Frodsham was part of the GB basketball team which won Gold in the 1959 games. Unfortunately I cannot find any pictures or programmes from these games. There was a printers strike at the time of the games and so there seems to be no Newspaper articles from these games. I would love to see a programme and possibly a photo or two.